Store pots, pans, kitchen utensils, and more over your cooking equipment with the Regency universal double sided pot hook! This pot hook is conveniently designed to fit pot racks from many popular manufacturers and brands, and it quickly replaces old or worn hooks so that you can keep your kitchen running smoothly. It is nickel-plated to ensure durability, and thanks to its double sided design, you get twice as much storage space as you would from a regular pot hook. These are a must have to maximize kitchen space. Much cheaper than at my local supply stores. Just as I expected, clean neat good product, and what I was looking for. These pot hooks are fantastic! The wire is about 1/4 inch thick and has no flex at all, even when holding a large cast iron skillet. I use them on a Regency wire shelf, where they fit perpendicular to the long side of the shelf. They are low slung enough that I can mount a single pot to one side without it falling off. They also work well for holding small wares that have a ring or hole larger than 1/4 inch. I’m glad I ordered the double sided instead of the single sided. They hold things on just one side perfectly well, but the second side allows me to store pots and their corresponding lids together. In the 5 months I’ve used them, I’ve been very happy with the extra space and efficiency they have given me in my kitchen. These hooks are Very handy and useful for more than just pots and pans. I would buy them agin. I even use them in my home. All of these Regency wire shelving products are heavy duty nice commercial quality thick chrome. No chance of these hooks getting bent easily (careful where you install these if traffic around!). Excellent for the price. Before these hooks we kept all of our utensils in a disorganized heap in the bus bins. They've been an important organizational tool for both our bakers and chefs. this hooks are so strong , we hang all our pots and pans , it makes it so easy to organize all our utensils . easy to use. We got these hooks to use with our pot rack (#600SLW72) that we installed in our kitchen. High quality and it's great using both hooks to hang pots and pans. Double Sided Pot Hooks are a must in any kitchen! They have given us a lot more organizational space, without having to add any extra shelving. We use these to hang stuff from our ceiling mounted storage. It allows us to keep some counter space free in our very small coffee shop. These hooks are great for hanging pots and skillets as well as spoons and ladles. It helps keep them readily available and up off of tables and shelves. What I have been missing! These double pot hooks can double, triple, or even quadruple your storage space under wire shelves! They are heavy duty, durable, rust-resistant, and can't just fall off the shelf easily like s-hooks I've used in the past do! Another space saving item. We hang these hooks on to our wire shelves, providing us even more room to store things. This double sided option is even better. These do the job great, i like them to hang spatulas on as well as many otger items. Thet are a great price, easy to use amd hang. Stay stable once hung on rack. These hooks are a lot bigger than I thought they were going to be! Very tough and durable. What a great product at a great price! These have worked great for us so far. We use them in the kitchen and they are easy to use and they are nice looking as well. Overall happy with these hooks, would be better if they were slightly larger. They fit right onto the side of existing metro racks and free up shelf space. these double sided hooks are meant to be used in conjunction with a wall mounted pot rack. it is very useful because it is capable of holding two pots per hook. Some of these hooks came with a shelf which we purchased, but we bought more because they are very nice for keeping everything organized. They are heavy-weight and don't rust. The best money I ever spent. Improved work flow by having these hooks. Helped rearrange my pot rack to maximize space in the kitchen. Cheap and strong. These pot hooks are perfect for saving shelf space in our kitchen! Highly recommend them and they are a great price after comparing to others! Probably one of the cheapest items that is essential to kitchen storage. This has increased space in the my kitchen and allowed me to clear an entire shelf that I can use for other stuff now. Get plenty of them. Super useful if you need to hang up some pots or pans in your kitchen. You don't have to worry about it breaking thanks to the material. Good price too. We use these pot hooks for all of our utensils in our bakery. Now our utensils are hanging out of the way and within easy reach of our prep crew. Before getting these hooks, we had a mess of utensils in a tub and a drawer that collected a fine layer of flour--not to mention, the annoying task of rummaging through the utensils to find that certain spatula we were looking for. Much better than hooks I could find from other sources at this price. good quality. Sturdy enough for any weight pot/pan etc. Wish I had found them sooner. 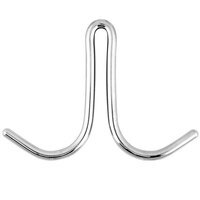 These hooks are very sturdy and do a great job of holding almost any size pan. We hang multiple cast irons on these with no problems. These are great hooks. We have a custom made 2" flat bar pot rack in our concession trailer and these hooks fit perfectly and saves us on space by doubling up the pots/pans. Even when we have 1 pot hanging it doesn't fall off. Great price! This is a must have in commercial kitchens. I got some extra hooks to place on my wall mount pot rack and can hang more pots and pans to keep room in shelves for other items. Good quality product, though the hook is too small for my hood...so I ended up returning this pot hook. otherwise i would had liked product very much. Already added them to cart. A great accessory in the kitchen. We use them with our wire shelves, to store pans and various utensils. A must have! These are very sturdy pot and pan hooks, the finish has held up well, another brand we bought in the past started to rust almost immediately - these have not and are great so far. Very pleased. These turned out to be the perfect size pot hook for our racks. You can never have enough! They are great for hanging up all sorts of kitchen utensils too. These fit perfectly on our pot rack, although slightly shorter than the original ones that came with our rack. They work great so far and now we're able to hang more items, which majority are lightweight. We haven't tried the heavier pans or whatnot but they sit on shelves anyway. These were a NO for me. I was very excited to get these, but was later disappointed to find that they WOULD NOT hold ANY of my pots and pans. If I put 2 pots (one on each hook) on at the same time, the weight would equal out and allow the hook to stay in place. However, if I tried to hang just one pot/pan on the hook, they ALWAYS immediately slid off. Not a good product. Thank you for your review! We're sorry to hear this pot hook didn't work out for you. It is important to note that these hooks will not work on a wire shelf. They are designed to fit on pot racks. If you want to hang pots off of your wire shelf, try this Regency J-Hook for Wire Shelving. Not happy with these hooks. I thought they were a great price but you get what you pay for. They are too short. I need to hang utensils on them but if you don't have the same weight on each side they don't work. I currently have longer ones & they work great. I need to spend the extra for longer ones.